Winning the toss on a bright and warm day in Deutweg, no-one was quite sure while Power captain Mubarek hestitated in his decision to bat first. But bat first they did and their innings began in style with the first five balls being taken for 15 runs, a signal to what was going to be unleashed on the day. The loss of wicket on the last ball of first over brought in the Swiss International Shanawaz Muhammad. Renowned for his hard hitting, he did not waste any time and immediately went like hell for leather, quite literally! Shahnawaz ended up scoring a spectacular 140 runs, a feat not common in Swiss Cricket. His spectacular feat included 16 huge sixes. The finishing touch to the innings was provided by Afzaal Sikander, who finished with an enterprising 35 not out and Power finished with a massive 245 for the loss of just 5 wickets in their allotted 20 overs. Poor fielding from defending champions Nomads CC did not help in their quest and dropping Shahnawaz thrice severly damaged their chances of restricting Power to a more conservative toital. However, after a brief 10 minute recess, the defending champions set about the task of chasing the big score. Nomads chase started badly by losing a wicket with the third ball of the game with just 1 run on the board. However, a quick partnership of 75 between Faheem and Asvin in 7 overs put Nomads back in hunt. Nomads could not sustain the momentum of scoring runs at quick rate and kept on losing wickets at crucial points in the game. When Faheem was finally caught on the boundary for 68, hopes of any miraclous run chase disappeared. Kannan batted well with 34 not out and Nomads finally ended their innings on 216-7 in their allotted 20 overs, losing the game by 29 runs. 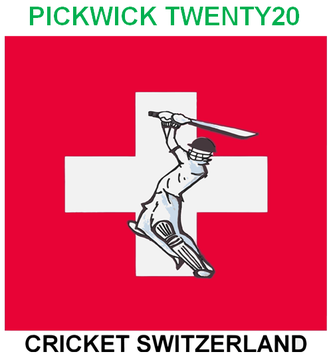 If the first game is any indication of what the season is going to throw up, Pickwick Twenty20 cricket fans in Switzerland are in for a big treat.